Designing a landing page is no easy task. There are many moving parts to consider, including copywriting, design, social media, and CTA placement. And with so many decisions to make (both big and small), it’s no wonder that mistakes can easily occur. 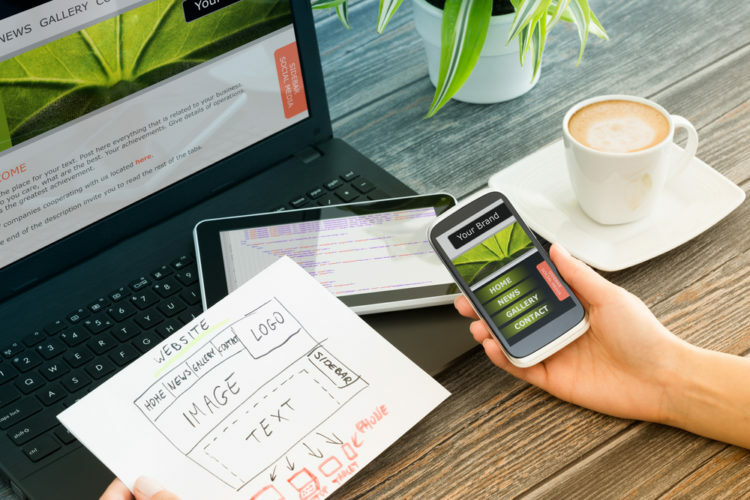 In many cases, business owners fail to take the proper precautions to ensure their landing page is up to par, both in terms of design and functionality. Sometimes, they even let simple mistakes slide. There are many platforms available, and choosing the right one is crucial. WordPress is touted as one of the best lead-generating landing page platforms because it’s simple to set up, and creative freedom is nearly endless. You can choose from thousands of free and premium themes, and even install plugins like Elementor to build your product landing page with drag-and-drop functionality. Then, there are other platforms designed to help you launch simple product landing pages, like LeadPages (which offers WordPress integration), Unbounce, and Instapage. These may offer a quicker set-up but are typically very limited in terms of design. Think about your site goals before you choose a platform. For example, if you want to be able to incorporate certain features, like immersive photo galleries, you will need a platform that supports it. Or, if you think you’ll be using an independent designer or developer in the future, go with a platform that allows you to scale in that direction. Budget is another thing to keep in mind. If you’re just starting out or still growing your customer base, you might want to start with a cheaper option, like WordPress, which you can get for as low as $10 per month. Other lead-capturing landing pages cost anywhere from $30 to $200 per month, and even as high as $2,400 for platforms like HubSpot. Believe it or not, in most cases, people don’t like to see stock photography on product landing pages. It might be okay for your blog posts, but it requires special consideration for your landing page. A study conducted by MDG Advertising found that 67% of online shoppers consider quality images to be an integral part of their decision-making when it comes to purchases. The more vivid and authentic a photo is, the more likely they were to perceive ownership. For software, beautiful screenshots are the way to go, and it would be fine to juxtapose humans with your software imagery. Sometimes, stock photography is the easiest way to mesh the two, but you might also want to add a high-res photo of someone actually using the software to add that extra touch of authenticity. If you do use humans in your photography (whether stock photos or you your own), bear in mind that studies have shown that site visitors tend to look in the direction of the eyes that belong to the person in the photo. Therefore, you’d ideally want to have the person looking in the direction of your text. Before you start working on your landing page, ask yourself, “What’s my main goal here?” One of the biggest mistakes people make with landing pages is cluttering it with too many options for the visitor. For example, it can be overwhelming to visit a landing page that wants you to read articles, sign up for a newsletter, purchase your newest product, watch a video, AND request a quote. This doesn’t mean that you can’t have multiple points-of-purchase or ways to appeal to your potential customers. Instead, you should have a core goal that stands out above the rest, rather than blends in. Think about the singular action you want your visitor to take: this is called the call-to-action (CTA). Your call to action should be decently-sized, stand out, and be placed in the right area to attract the most attention. Use split testing software to help you choose between different types of CTA. This will help you choose the option that converts best. Having too much copy on your landing page can be fatal. As previously mentioned, most people don’t have a very long attention span, and every small decision about your copy–from size to typography to color and word count–plays an important role. Too many words create information overload and dilutes the message you’re trying to get across. Keep your sentences and paragraphs short and concise. Try to avoid using one of the pages to dominate the text. It’s best not to align left or right when you’re working on landing pages. Instead, you want to spread bite-sized bits of copy across the page evenly. You want your copy to be as scannable as possible, and clunky paragraphs make it very difficult to achieve this. For optimal results, try breaking up the text by using well-designed icons, mini-paragraphs, bullet points, color-coordinated sub-sections. When it comes to a marketing report, you may dread the idea of seeing pie charts, bar graphs and numbers floating around. That’s not to mention the accompanying dry, boring analysis of these results, written in what looks to be a different language. If you think this, you’re so very wrong. 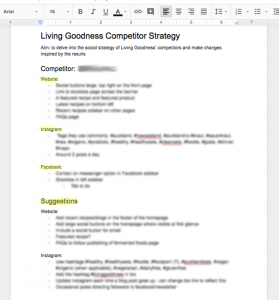 Recently, I wrote up a competitor strategy analysis for a client, Living Goodness. The results took no longer than 30 minutes, there were no graphs, and the report reads just over a page long! Read on to find out exactly how I accomplished this – it’s super simple, I promise. Seriously, this is 97% of my report – short and simple! If you’re running a business and have no idea who your competitors are, you need to remedy this quickly. Open up your internet browser in incognito mode and Google search a few keywords on what your business is about. Why incognito? Well, the search results will be personalised to your search history so you want to find a competitor that is worth analysing. 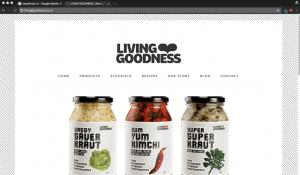 Living Goodness sells sauerkraut, so I typed into Google, “sauerkraut nz”. Google has been working on improving localised searching since around 2015. 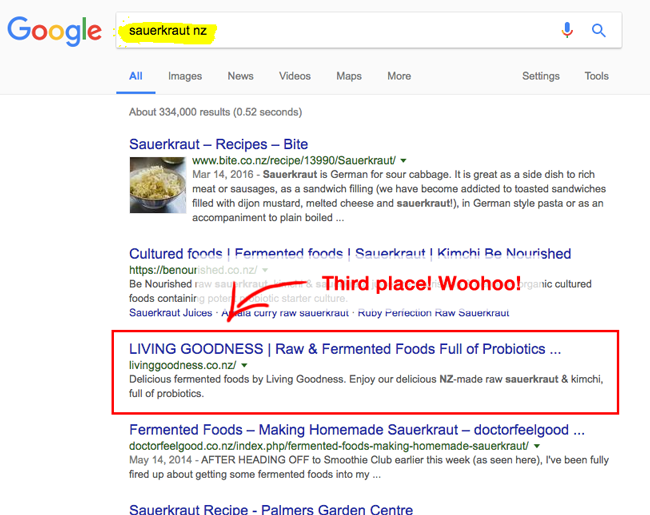 While obvious searches such as “Italian food” will bring up local restaurants, I needed to localise Living Goodness keywords so that Google knows I want to buy this product from a local store, as opposed to just needing a sauerkraut recipe. 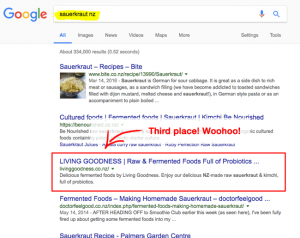 Living Goodness ranks on the front page for “sauerkraut nz” (yay!) but so does a competitor. This will be the target of my strategy analysis. Third place on the front page of Google! Yay Living Goodness! You’ll need to adapt these to suit the media platforms of your client. From the competitor’s website, I can see all their social media buttons on the top right. This is the first difference I note. 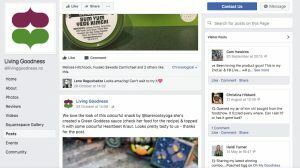 Living Goodness’ social buttons are in the footer of every page, but that requires scrolling down to see. Placing additional social links somewhere on the homepage where they will be visible to visitors is the first thing I make note of in a section called “suggestions”. I embark on a journey across the competitor’s website, making note of what they have and what Living Goodness don’t have on their website. Along the way, I kept asking, “why?” For example, the competitor lists recent recipes on a sidebar on their landing pages. Why is this? Well, as a mere consumer searching for sauerkraut products, I can see that it will prompt me to head to the recipes page, especially if there’s a delicious concoction that catches my eye. A sidebar can easily be installed into websites as an automated widget – this means any new recipes uploaded will reflect in this sidebar without additional action, thus providing fresh content for each time I visit their website. Next, I compared the social media platforms of Living Goodness with their competitor. I pulled up their Facebook and Instagram pages, and scrolled through like a scorned ex-girlfriend. How often did they post? What sort of content were they posting? 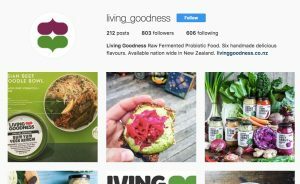 Did they do something different on their social media pages that Living Goodness didn’t do? Who had more followers? Why and how? These were all very important questions that I needed to ask. I also compared the hashtag activity because everyone knows that behind every successful Insta-famous account is a strong hashtag game (also pretty photos, of course). As this competitor sold products that were pretty similar to ours, I derived a list of hashtags that our client doesn’t use but should do. 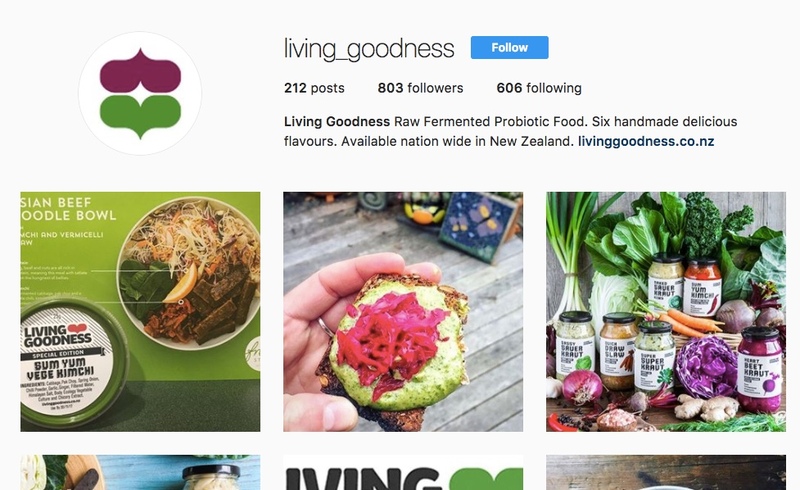 Living Goodness’ products are very visually appealing, so their Instagram needs to reflect that. Of course, I didn’t want Living Goodness to copy their competitor post for post. This strategy was merely to boost their digital presence, just based on my observations of their competitor. One important thing I had to keep in mind at all times was objectivity. 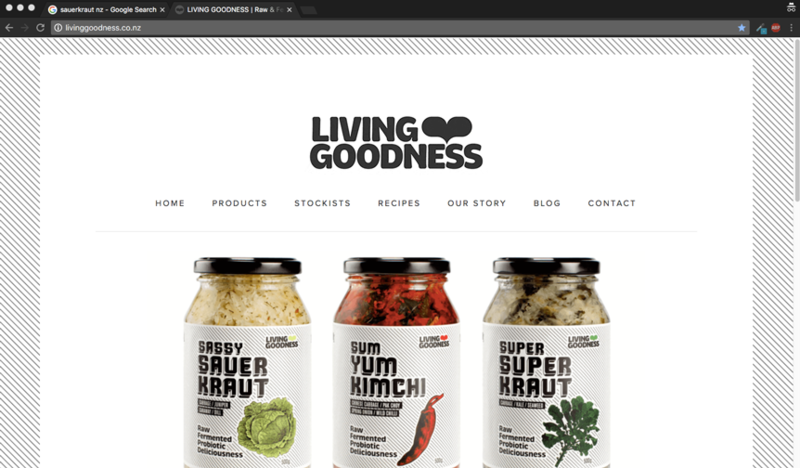 I had to see Living Goodness’ competitor from the eyes of a hungry 20-something-year-old who just wanted buy sauerkraut. This allowed me to cruise through their website and social media platforms from a fresh perspective. What would I first notice if I wanted to buy some of their products? What would annoy me if I were trying to see their stockists? If I needed to read reviews of their products, was it easily accessible? With this frame of mind, I also turned my attention to Living Goodness’ own platforms to see what needed to be changed. 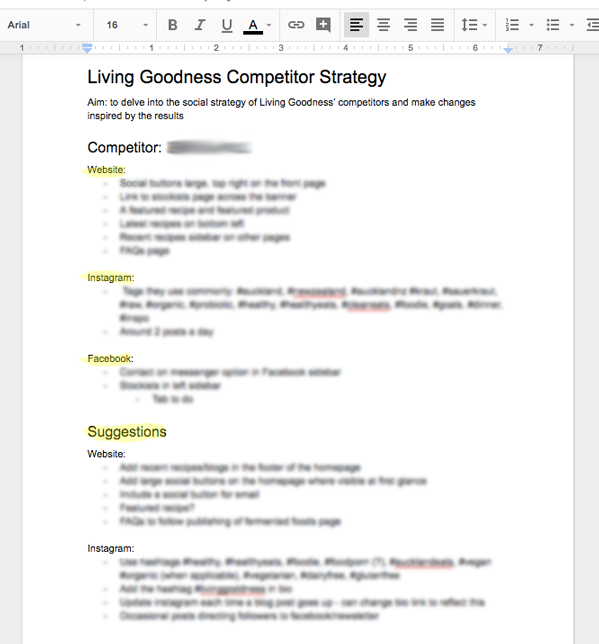 From all this, I wrote out a brief but very useful competitor strategy, using clear subheadings and bullet points. Easy to write, easy to read! I all but stalked the social pages of Living Goodness. As you can see, this is a proven and justified technique. I scheduled a meeting with the lovely Fiona from Living Goodness and ran through this report with her. It was important that she took the same journey I did, so in a few cases, I got her to open up the social media platforms to see exactly what I was referencing. Next time I conduct a competitor analysis, I could include screenshots to highlight my points. As it was, Living Goodness only have one major competitor, and as I had explained my strategy clearly, it wasn’t just another boring report to be tossed aside. When it comes to working for a client, it can be too easy to lose sight of the bigger picture. This report showed that we like to keep an eye on the industry to boost the presence of Living Goodness. We pitched a client – we didn’t win. And so I decided to show you all how we assessed their website in scoping out the work that is needed to improve the search engine optimisation for this company. They offer a local service and have two principal products. 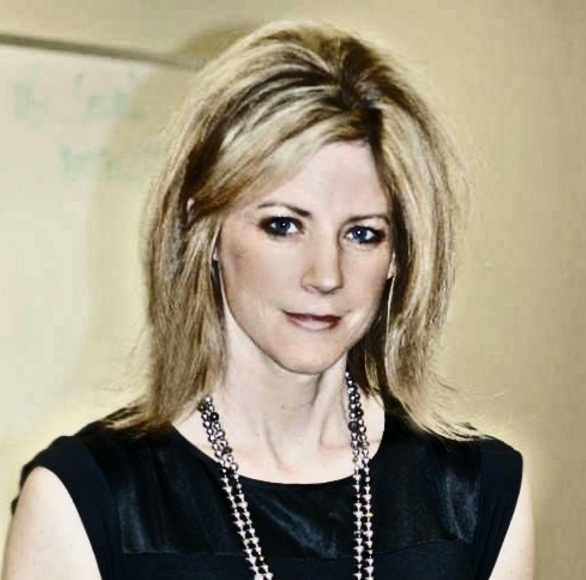 Go to the Woorank checker or Website Grader tool on Hubspot. Find out how your current site performs. Both give you a score out of 100. Easy to see your score. This site scores 53 out of 100. Definitely in the could-do-better group. Pearl Waterless is a strong point of difference for one of the services – but you don’t EXPLAIN it. Plus it’s a “Green” product and you could be selling the environmental benefits. 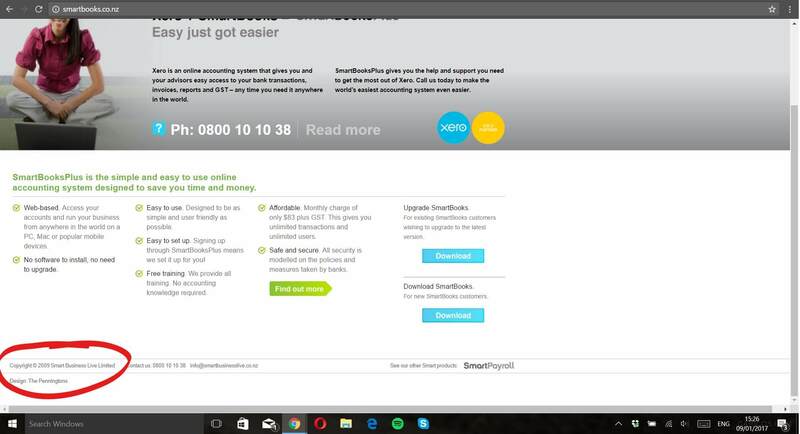 The other service page has a gigantic photo and doesn’t explain the service in detail compared to the other service page. They should be similar – consistency matters. You have a Facebook page but there’s no link to it on the site. 42 people have shared your website onto Facebook – but you aren’t tracking links like this. Have you got any customer testimonials? Have you got any photos of your ACTUAL Team doing the work? Any funny stories to tell about your jobs? What about the Facebook photos you share – the team celebration – could these go on a blog on the website too? What’s important here is that the website owner sees a rapid return on investment for his marketing spend. The areas where I believe we can show a quick ROI are the services descriptors and aligning them to search phrases, pulling out the points of difference. And then making it super-easy for the site visitor to get in touch by phone. That rapidly increases enquiries, the business owner feels his spend is justified. Later we can get more sophisticated. And so if you would like us to improve the SEO and re-write some of the pages, go to our shop and buy our SEO Starter Pack and then come into the office and we’ll prioritise, get started and tick off all these things for you. It’s January – we are back from the Christmas break and many firms are still on a skeleton staff. Some are back full time – but we’re all filled with the pressures of a new year – new marketing plans, new services, new products. For most of us, we’ve already forgotten the marketing we did in December. But we shouldn’t. Because many websites are now inaccurate, out of date or just plain giving WRONG information. Here’s a good example I called up today. I got their “out of hours” telephone answering recorded message. It is past the 9th January and nobody’s home…. cooeee….. So if you have a holiday closure message on your website – get that fixed up and corrected pronto. Website CMS systems mostly offer automation services which allow you to set future dates to un-publish pages and posts. 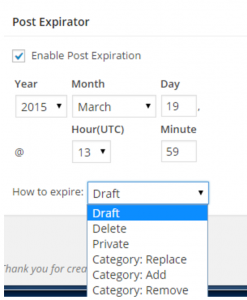 Take a read of this explanation of how to “expire” a WordPress post using the WP Post Expirator plugin. Set a future date at which the post will stop being visible – you can choose whether to return to draft or to delete the post. Here is the code to insert into your footer to ensure that the copyright year automatically rolls over on January 1st. Get it pasted into your website FAST. Of course, fixing up your mistakes now is fine – but wouldn’t it be better to not have made them in the first place? How about you set up reminders in your calendar to nudge you to manually remove or unpublish information? Get those plugins and extensions installed so the work is done for you by machines. Or pay an outsourced marketing consultant like Creative Agency Secrets to do it for you. Happy new year – and if you’re in need of some marketing and new business year planning, come to our Auckland workshop on 26th January. Is your website consistently driving results for your business? Is it adaptive to changes on the web? 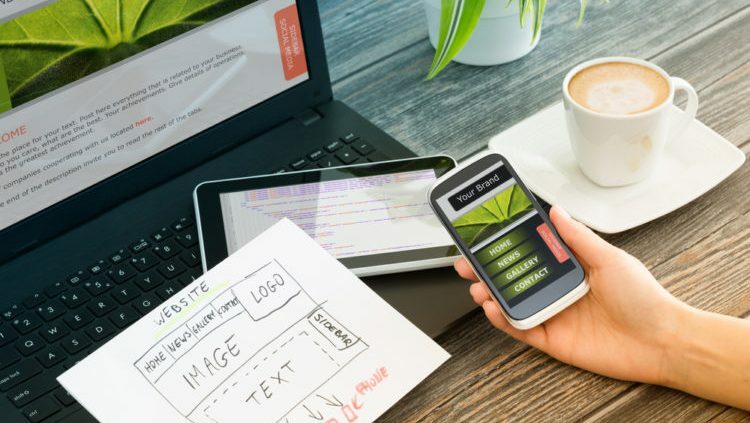 With rapid advances in website technology, design and function have evolved, bringing a new set of expectations to your visitors. With these expectations and advanced features ultimately affecting the success of the business online, being able to respond effectively is essential. We’re not saying a complete rebuild of your website is necessary every 12 months, but minor tweaks, layout improvements and updated content are just a few ways to keep your website fresh! The needs of your website, or at least how people use it, will likely change throughout its life. Being able to respond to that change is essential for maintaining customer engagement. It can be a daunting process. To make it easier, we have created a list of suggestions to ensure you unlock your website’s potential. 1. Build your site on a Content Management System (CMS) – such as WordPress, Drupal, SquareSpace. This is single-handedly the most important piece of advice for a business with limited web-dev resources. An advanced CMS platform offers huge freedom to customise content, compared to one that was hard-coded. You can easily swap bits in and out, and if you have a decent understanding of the system, make simple changes to the whole visual layout, without having to spend hundreds (or thousands) hiring a developer. Most CMS platforms offer an intuitive interface which removes the need to learn HTML too. This can be a real time saver, if maintaining the site is not your fulltime priority! With an increasing number of web visits coming from mobile devices, ensuring your site is responsive to different screen sizes is absolutely essential too. Many CMS platforms offer mobile responsiveness. If yours isn’t, you’re already way behind the game! Analytical tools such as Google Analytics + Search Console provide an incredible amount detail and invaluable insights as to how people are actually interacting with your site. Goal tracking, a powerful feature of Google Analytics analyses the effectiveness of particular product channels and sales conversions. Set up correctly, it makes it easy to pinpoint where customers are dropping off or what is triggering purchases. This helps to outline where you can improve your sales channels to maximise conversion success. Analytical software allows you to observe a range of other insightful trends too: Are there large blocks of text that are being ignored? Are your visitors finding what they are looking for? How far down the page are they viewing before losing interest? Thanks to tools like Sumo and Crazy Egg, we can gain a much deeper understanding of how visitors are using our website. If nobody pays attention to that beautiful full width banner, is it worth having? Making your site as easy as possible for visitors to use is essential for ensuring they become customers. The likes of Google Analytics are free to use, and most paid versions of software offer free or limited period trial versions. There’s no reason why you shouldn’t be looking into them! 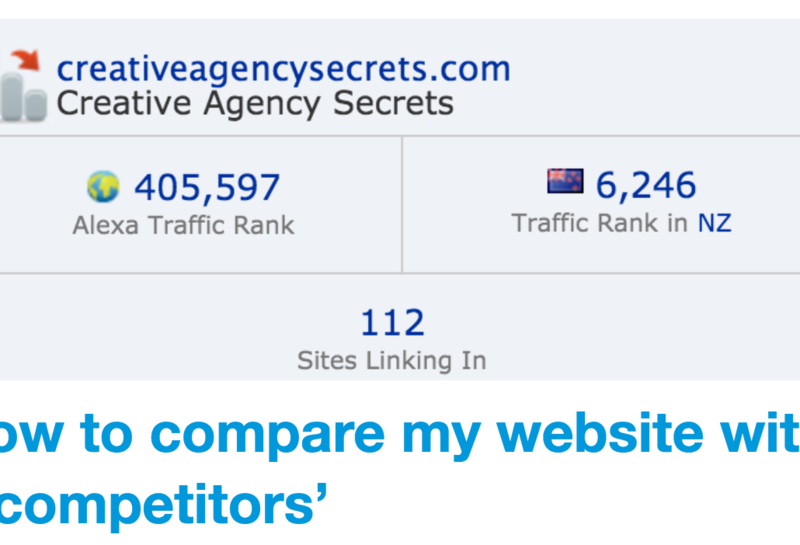 If the majority of your traffic is ignoring your featured product, swap it for something else! If they are searching for an FAQ, make sure it is clearly visible from the homepage! Are visitors dropping off before they reach your call to action further down the page? What can you change to ensure they all see it? If they aren’t scrolling through, it is time you spent some time reworking your site’s layout. A lot of the work here comes back to your SEO (Search Engine Optimisation). Are you using the right keywords for your brand/offering? What words are people using to find your product/service? How do you rank in searches? One way to influence these variables is through regular, targeted content. Publishing blog articles or (even better) video material is an easy way to give visitors a reason to keep coming to your site. This in turn, boosts the value of your SEO. Don’t stress if you can’t maintain a schedule of posting each day either. If you have a big catalogue of material, drip feed it out over the course of the year. Maintaining a steady rhythm is far better than dumping 20 articles all at once. Consistency is the key here! 5. Do the words on your site clearly describe what you do? It’s one thing to write for the Google bots that will crawl your site and determine where to show you on search, but at the end of the day, decisions are made by humans. If your visitors are browsing your website desperately wondering what it is exactly that you do, chances are they are going to move on pretty quickly. No amount of keywords will help if your message doesn’t make sense. If you don’t have the time or the confidence to write your own copy, it’s highly worth getting someone to do it for you. Real life testimonials from customers who have actually purchased or worked with you can make or break the decision to buy from you. There are a number of places where these can come from – Social Media pages such as your Facebook page or your Google My Business page are just two, but there’s nothing stopping you from replicating them on your website (with their permission of course!). Displaying customer logos (if your work is B2B) is a great way to showcase your brand’s credibility. Whether that action is in the form of purchasing something from your website or filling out a contact form, it’s absolutely vital that you make it as easy as possible. The less hoops prospective customers have to jump through to get what they want, the more inclined they will be to take action. If you have hyperlinked text as your call to action, consider substituting it for a big eye-catching button. The call to action is the main objective of your page, why hide it? If you are not sure what is and isn’t working, or if you know your website needs a bit of a touch-up, talk to us – we are the experts! I had to write to a client recently to tell them that their home page was failing. It was not delivering value, it was not doing its job and was actively causing problems for the business. And this made me realise that few businesses understand the job a home page does. What should a good home page design do? If you are an online shop, the home page has the job of showing the specials for the month or new product lines. It is often a straightforward design to implement. If you are a software company, the home page is usually a sales page promoting and explaining your principal products. But most business websites have a different challenge, especially those who do not sell by ecommerce. 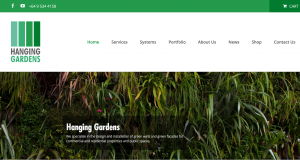 They have had a website for a few years; they may have had a couple of redesigns and the business website has probably grown to tens, hundreds or thousands of pages over this period. The priorities of the business shift over time and the website home page needs to support the new business goals and objectives. How often should I change my home page? 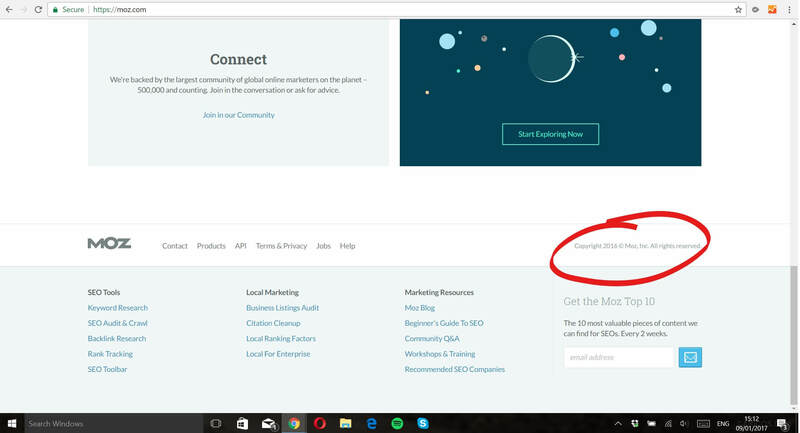 Should the home page have all the information about the business? What should the home page prioritise? The job of a website home page is to get the visitor to her destination in as few clicks as possible. Your entire website comprises a heap of different information, advice, products and services and a visitor may be interested in all, one or none of them. So how can you guess what the latest web visitor wants? This is where intelligent home page design comes in. The principal task of the home page is to signpost the visitor FAST to where she wants to go. So let’s work out what this means for your website. b) the search queries people typed into Google which had your website showing up in search results (this comes by linking Search Console to Google Analytics – here’s how to set it up). Your job is to line up b) with a) so we get the maximum number of people coming to the site and getting quickly to the exact page they are looking for. You now know the top two to five pages on your website (after the home page itself). I’m going to offer some advice here which will help you brief your designer on the changes you need to make to your home page. Firstly – simplify the main menu. Can you remove any of the top menu items? Give the visitor as few choices as possible, stay focused on those top destination pages. Can you reduce your menu to 5 options? (Home, About, Contact Us plus 2 others?). Can you remove sub-menus or drop-downs? We advised Armour Safety to put icon images of their popular product groupings on a side menu; ordered by popularity. Clicks followed immediately we made the change. Secondly – highlight popular destination pages in the home page design. Make it very obvious in the home page design elements what these are. You can use images, boxes, icons, buttons, large text – all are useful devices to focus attention. By repeating these popular destinations in the home page design and the top menu, you increase the chances that the visitor will choose an already popular pathway. Coxmate.com.au now does not show its products on the main menu – they send visitors direct to the shop which has its own home page and details all the categories. Similarly, Apartment Specialists has 3 buttons on the home page, I’m Buying; I’m Selling and I want a Valuation. All three are on their menu, but the buttons make it easier for visitors to quickly decide where to click. Thirdly – you have to reinforce the already popular page destinations – this may sound counter-intuitive. Don’t try and encourage traffic to pages that are not already popular i.e. double down your bets on the well-performing pages. This is the 80:20 rule in action. For the visitor who does want something unusual if they cannot find it from your menus, be sure to make it very clear how to get in touch to ask the question. So go check how your home page is performing in its duty as a sign post – and don’t be afraid to make changes iteratively – one small change at a time so you can measure the effect before altering other elements. We use our 8 Step New Business Development process and each has a category – this blog post is related to Step 1 – State your Business. Click on the icon to see more posts in that category.